TUDOR GOLD’s 60% owned 650 hectare Electrum property is located directly between the past producing Silbak Premier mine some 25 Km south and Pretium Resource’s Brucejack deposit (production slated for 2017) some 20 Km to the north. A well-developed 40 km road directly links the property to the bulk tonnage shipping terminals in Stewart. Electrical power lines come within 18 km of the property and can be continued along the existing haul road. The past producing Big Missouri mine is also located 14 down the haul road from the Electrum Property. 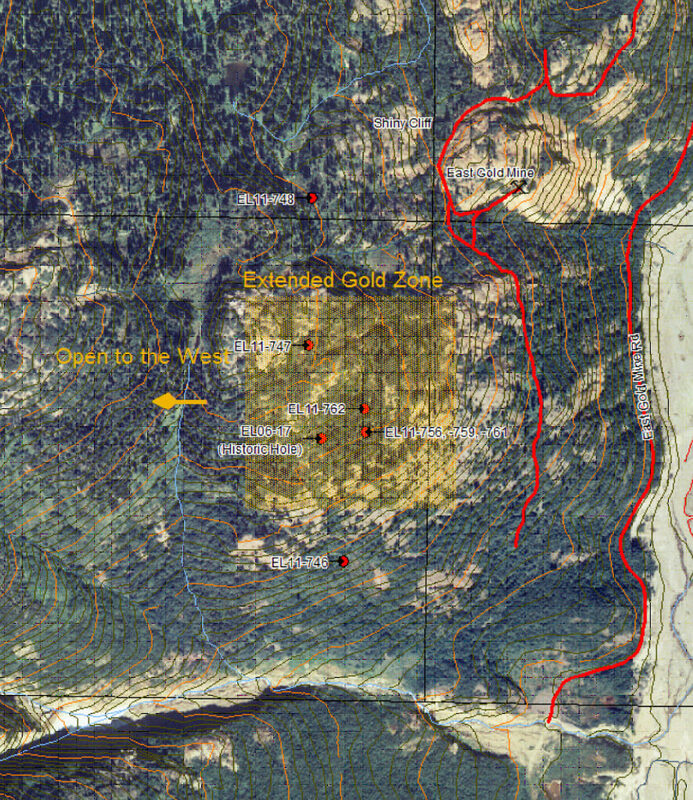 Mineralization on the Electrum property is controlled by two major fault lines that locally produces bonanza type gold grades along with broader stockworked zones within a complex geological model. Like the nearby Brucejack deposit, gold and silver mineralization occurs as coarse electrum in several generations of quartz-carbonate veins and vein breccias hosted within a deformed island arc-related sequence. The intermediate to low sulphidation mineralization is present in most of the veins with pyrite, sphalerite, galena and chalcopyrite. Precious metal mineralization is found in surface with lengths near several tens of meters to over a hundred meters, pinching and swelling along strike. Drilling has encountered gold-silver mineralization at depths greater than 200 metres from surface. The Electrum property hosts the historic East Gold mine where intermittent small-scale production between 1939 and 1965, produced 3,816 oz of gold and 2,442 oz of silver from 45 tons of hand selected ore (BC Minsitry of Mines Assessment Report 30206a). Between 2006 and 2007 a total of 66 diamond drill holes comprising 15,369 meters was completed (American Creek Resources Ltd. Press Release June 6, 2007, December 11, 2007 and March 16, 2008, BC Ministry of Mines Assessment Report 30206a). Multiple targets were tested and values range from no significant values to 29.9 grams gold and 10.2 grams silver per tonne over 2 meters. all intersections are presented as drill hole intercept width and are not necessarily true widths. BC Assessment Report 30206a. This exploration was completed prior to Tudor’s involvement in the Electrum project and Tudor has not independently verified the assay results or the geological information provided. The historical information provided above, although considered reliable and relevant, may be subject to future correction and should not be relied upon. Surface sampling in 2008 and 2010 focused on extending the mineralized zones to the south of the historic East Gold mine in an area with little previous drilling over an extension of 500×500 meters. In 2010, follow-up chip sampling collected from epithermal breccia-veins identified new targets. A total of 15 samples were taken in 2010 with nine returning significant values and six yielding no significant values. A drill program aimed at testing the stockwork style mineralization at depth, working towards a lower grade bulk-tonnage resource was completed in 2011 during a 7 hole 2, 105 meter program. all intersections are presented as drill hole intercept width and are not necessarily true widths. American Creek Resources Ltd. Press Release dated December 15, 2011 and April 13, 2012. This exploration was completed prior to Tudor’s involvement in the Electrum project and Tudor has not independently verified the assay results or the geological information provided. The historical information provided above, although considered reliable and relevant, may be subject to future correction and should not be relied upon. Tudor is currently evaluating the potential for outlining a high-grade zone of mineralization similar to the Premier and Brucejack projects. The Electrum property has potential for high-grade gold-silver mineralization in epithermal breccia-vein systems that consistently follow a 120-130 strike direction. These types of results have been confirmed in drilling where epithermal breccia veins were intercepted like the drill intercept og 440.78g/t Au over 0.52 meters (EL06-18), or high silver values such as 583 g/t Ag and 2.44 g/t Au over 0.30 meters;(EL07-09); EL07-12 (420g/t Ag and 4.88g/t Au over 0.91 meters); EL07-18 (374g/t Ag and 7.00g/t Au over 0.65 meters) and EL07-09 (384 g/t Ag and 2.49 g/t Au over 0.70 meters). 24 samples taken from the Shiny Cliff averaged 248 g/t gold with 27,092 g/t silver. Samples collected from a boulder 20m down slope from the Shiny Cliff averaged 10 g/t gold with 857 g/t silver. 11 samples were collected along a quartz vein at the Rico showing averaged 54 g/t gold with 11,512 g/t silver. 13 samples collected from the Mine Hill Showing, which is roughly halfway between the historic East Gold mine and Shiny Cliff Showing, averaged 6 g/t gold with 522 g/t silver. A 1,000 meter drill program was initiated on June 22, 2016. This page contains forward-looking statements. Please read the Legal Notice for further information.